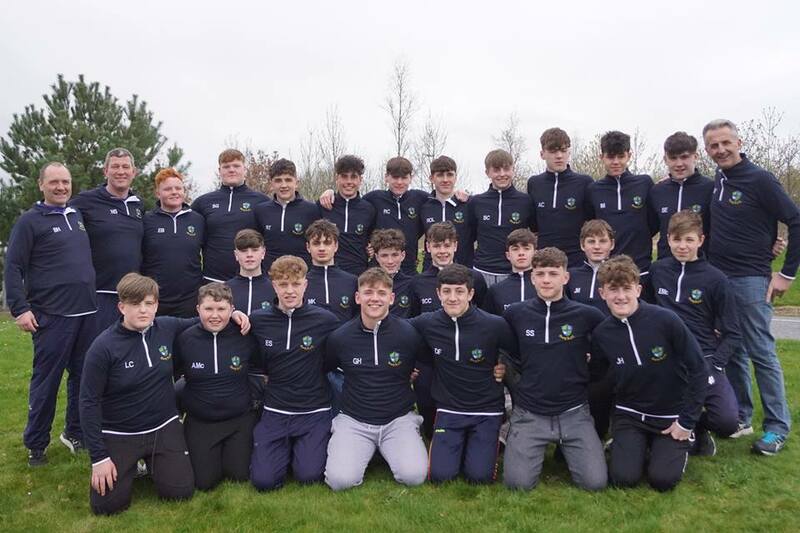 Having won their provincial Final, on St Patricks Day, Gorey’s 16s represented Leinster in the All Ireland competition on Saturday 30th March. Their opposition were the Ulster Champions, City of Armagh RFC, with the match set for Banbridge RFC in Co Down. Kick off at 1 led to the boys and their supporters having an early start to make their way north. Conditions in Banbridge were decent being dry but with a considerable breeze blowing into one end. The lads played in to the wind in the 1st half and immediately took the game to Armagh. The Ulster representatives had some fine players with a big athletic pack and strong backs especially at 11 and 12 so Gorey had to work really hard to keep them pinned in their own half and succeeded in doing so. The pressure paid off with an early penalty being awarded, that Lee Cushe slotted very well, to give Gorey a 3 – 0 lead. The kick off was well gathered by Gorey who again worked their way up the field with some good hard runs by the forwards along with darting breaks from Jack Higgins at 9. Again the pressure paid off with another penalty concession punished by Lee for 6 – 0. Armagh came looking to get a score and a foothold in the game. Backs and forwards defended together strongly but when an Armagh player broke through, and threatened to score, Brian Cushe took him down with a great tackle. The real reward for all Gorey’s hard work came just 5 minutes from half time. Some super carries by the pack got Gorey up to the Armagh 5 metre line. Several pick and go attempts by George Hadden, Evan Byrne and Sean Egan were repelled by a stubborn Armagh defence but the forwards kept recycling. The lads then worked the ball out wide to the left, with good interplay by the backs, for Simon Campbell Carty to release Ronan Cleary to score in the corner. Jack Higgins stepped up to take a very difficult conversion, identical to one he took in the Leinster Final, with the same brilliant outcome for 13 – 0 at halftime. Armagh threw everything at Gorey on the restart. Massive carries by their 8 and 12 set the tone for what was to come. The lads put their bodies on the line, in particular Sean Sawyer and Ewan Stephens, but the pressure was just too much. 5 mins in Armagh scored and added a conversion to 13 – 7 and game on. Armagh were right back in now and came looking for more. Super tackling throughout the team but in particular Michal Kruczek and Ross O Loughlin in midfield kept them at bay along with some aggressive rucking from Daragh Fitzpatrick, Rory Tubritt and Adam Cleary. Gorey steadied and worked their way back in to the opposition half. Patient build up play got them close to the line and from a back of a ruck George Hadden picked and crashed over with Lee adding the extra 2 for 20 – 7. 15 mins left on the clock but far from over. Armagh shrugged off the score concession and worked incredibly hard to get back up the field. With the Gorey lads understandably tiring from all their efforts so far Armagh made more ground. Within 5 mins they scored just to the left of the posts, and added the conversion, to bring the score to 20 – 14. With about 5 mins left on the clock, and knowing a converted try would win it, Armagh came again. After some desperate defending, and several near heart failures later, Gorey worked their way back in to Armagh’s half and there was great relief and celebrations as the final whistle sounded. Final score 20 – 14. The lads will play Bandon RFC in the All Ireland Final on Sat 13th April but before then have a Cup Quarter Final, on Sat 6th, away to Naas RFC.